In 2012 a unique request was received at The Chatlos Foundation offices. Ann Marie Medlar, a self-described “blind athlete” acting as grant writer for The Halifax Rowing Association presented the following information. Upon learning that the Halifax Rowing Association was founded in 1994 to provide rowers of all ages and skill levels the opportunity to enjoy and embrace the sport of rowing an idea was born in the heart and mind of Ann Marie. She was about to offer the association a new challenge. What about starting an adaptive rowing program for athletes with disabilities? Adaptive rowing became popular in 2005, when the International Paralympic Committee voted to include it in the 2008 Paralympic Games. This major decision set the wheels in motion for the growth of adaptive rowing worldwide. For those readers who might not know: rowing, often referred to as crew, is a sport based program designed to propel a boat (racing shell) on water using oars. The practice dates back to Ancient Egyptian times thus modern rowing, as a competitive sport can be traced to the early 18th century and is one of the oldest Olympic sports competitions dating back to the 1900’s. In early 2012 The Rowing Association enthusiastically embraced the idea of an Adaptive Rowing program and agreed to expand its membership to meet the needs of those with disabilities. Not one to let any grass grow under her determined feet the next day, after the endorsement, a member of the organization introduced Ann Marie to one of the many pieces of training equipment housed in the Halifax boathouse. Just 10 days later she competed and won the gold medal in the 2012 Indoor Southern Sprints at the Florida Institute of Technology in Melborne. 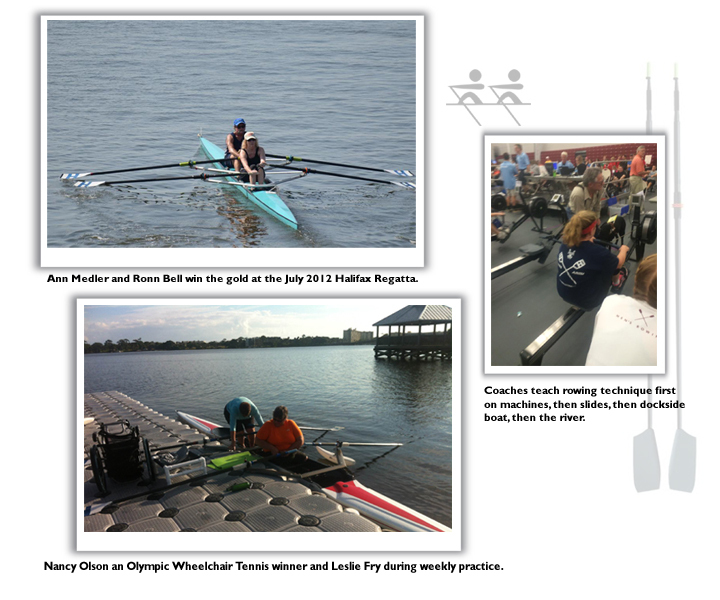 The HRA Board of Directors and coaching staff asked Ann Marie to see if other people with vision impairments would be interested in participating in a rowing program. She contacted several organizations: The Center for Vision Impairments, Conklin Center, Bureau of Braille and Talking Book Library Services, Florida Federation for the Blind, Community Tennis, Blind or Paralyzed Veterans and many others finding enthusiastic interest in the rowing program. In order to get this new program off the ground, and because equipment is expensive and available funds were scarce, Ann Marie decided to begin searching for potential grant opportunities. She found The Chatlos Foundation located just down the road from Daytona Beach where HRA is based. Able to use a JAWS software program known as JawsAccessWithSpeech that allows her to hear what is on the screen and a keyboard rather than a mouse to navigate around her screen as well as OCR software called Openbook that converts by scanning a printed document to electronic text format she was all set to contact The Chatlos Foundation, Inc. to see if there was any interest in supporting this new project. She was encouraged to send a written proposal, and was directed to the Chatlos website for additional information and her grant writing career was underway. Quickly the first grant request arrived and resulted in a discretionary grant, which helped pay for coaching and other rowing expenses. Encouraged by the first response another request was made in 2013 and 2014 both resulting in Board approved grants and their program was well underway. The group also received a grant from the Christopher and Dana Reeve Foundation to begin construction of an Americans with Disabilities Act compliant ramp giving adaptive rowers the independence to row with dignity. Some of the great benefits of this unique rowing program is to help build core and body muscles, improve cardiovascular health, lung capacity, by practicing at least twice weekly. Used by permission of the Halifax Rowing Association. Return to Spotlight on Others.